A leading world expert in nitrogen and plant science, Professor Cocking has long recognised that there is a critical need to reduce nitrogen pollution caused by nitrogen based fertilisers. Nitrate pollution is a major problem as is also the pollution of the atmosphere by ammonia and oxides of nitrogen. Speaking about the technology, which is known as 'N-Fix', Professor Cocking said: "Helping plants to naturally obtain the nitrogen they need is a key aspect of World Food Security. The world needs to unhook itself from its ever increasing reliance on synthetic nitrogen fertilisers produced from fossil fuels with its high economic costs, its pollution of the environment and its high energy costs." N-Fix is neither genetic modification nor bio-engineering. It is a naturally occurring nitrogen fixing bacteria which takes up and uses nitrogen from the air. Applied to the cells of plants (intra-cellular) via the seed, it provides every cell in the plant with the ability to fix nitrogen. Plant seeds are coated with these bacteria in order to create a symbiotic, mutually beneficial relationship and naturally produce nitrogen. 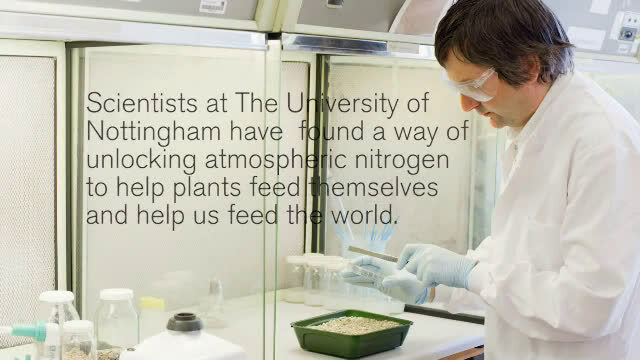 The University of Nottingham's Plant and Crop Sciences Division is internationally acclaimed as a centre for fundamental and applied research, underpinning its understanding of agriculture, food production and quality, and the natural environment. It also has one of the largest communities of plant scientists in the UK. Dr Susan Huxtable, Director of Intellectual Property Commercialisation at The University of Nottingham, believes that the N-Fix technology has significant implications for agriculture, she said: "There is a substantial global market for the N-Fix technology, as it can be applied globally to all crops. N-Fix has the power to transform agriculture, while at the same time offering a significant cost benefit to the grower through the savings that they will make in the reduced costs of fertilisers. It is a great example of how University research can have a world-changing impact." The N-Fix technology has been licensed by The University of Nottingham to Azotic Technologies Ltd to develop and commercialise N-Fix globally on its behalf for all crop species. Peter Blezard, CEO of Azotic Technologies added: "Agriculture has to change and N-Fix can make a real and positive contribution to that change. It has enormous potential to help feed more people in many of the poorer parts of the world, while at the same time, dramatically reducing the amount of synthetic nitrogen produced in the world." It is anticipated that the N-Fix technology will be commercially available within the next two to three years. Wow not a peep on this article, this is the biggest news I've ever heard! This is huge! Sell kochfertilizer.com, Agrium, CF Industries, Terra Nitrogen. And this will reduce demand for NatGas. The Middle East is suffering from drought, but a boost like this could affect politics in Egypt & Syria, for example. And ending nitrate runoff is a big freebie. You guys make what I study more awesome!!! How much fixed nitrogen is passed on to the host plant? Is it enough to make a significant difference? Will gene amplification be necessary before fertilization with N based can be eliminated? Who will be the first to move the gene from the bacteria into crop plants? Monsanto?!! Will the USDA (and the ammonia producers) do EVERYTHING in their power to make N-Fix appear to be useless, just like they did to methanol/C1 fertilization in the 90's (Nonomura & Benson, PNAS ~October 1992) [30 - 50% yield increase, quality improvement, and up to 50% reduction in water usage in follow-up work]? It is developments like this that serial doomcasters, like Paul (and Anne) Ehrlich et al and their followers, never foresee. I hope this works. If it does it will be big. How do ensure that the bacteria have the sugar available to get established in the roots? Will all seeds have to be prepared at a factory, or will these bacteria self-replicate with the plants without direct intervention? And this will reduce demand for NatGas. The Middle East is suffering from drought, but a boost. Wha? But...they will STILL have the drought....see? I'm suddenly reminded of Hal Clement's "The Nitrogen Fix"
"Replaces around 60% of plant's nitrogen needs"
At that rate it's not a "rather" it's a reduction in reliance. I agree that this seems to be an amazingly beneficial breakthrough. However, I wonder why nitrogen-fixing bacteria don't occur in nature, except in legumes and this sugar-cane example. Is there some other penalty or disfunction that we don'y know about yet? It makes me happy to see that at least one person who read the article was moved to ask the single relevant question. Same reason humans don't make vitamin C. It's something that's available in the environment, so if you use what's there, you use less energy and are more efficient at other things rather than making nutrients everyone else gets from around them for "cheaper." Those who use nitrogen fixing bacteria tend to be plants in nitrogen-poor soils, which includes a number of adaptations for this lack (seems to occur in acidic/swampy soils) so you've got pitcher plants and Venus fly-traps that supplement it with animal nitrogen sources as well. Where providing your own nitrogen is a competitive advantage, it wins out - where it isn't, it loses because others are more efficient. "Same reason humans don't make vitamin C. It's something that's available in the environment, so if you use what's there, you use less energy and are more efficient at other things rather than making nutrients everyone else gets from around them for "cheaper." Those who use nitrogen fixing bacteria tend to be plants in nitrogen-poor soils, which includes a number of adaptations for this lack (seems to occur in acidic/swampy soils) so you've got pitcher plants and Venus fly-traps that supplement it with animal nitrogen sources as well. Where providing your own nitrogen is a competitive advantage, it wins out - where it isn't, it loses because others are more efficient." Who will own the patent? This discovery does not mean that plants have any more resistance to pests or disease. It only means that a crop with this inoculation a crop will no longer have N as the limiting nutrient. That means that the growing crop will take up more of everything else it needs, and we arrive at needing some other element which is the new limiting nutrient. In a world where absurdities abound, where irrationality prevails, and living like there is no tomorrow while using up fossil resources. What this means is that Agriculture, which displaces wildlife habitat and degrades ecosystem benefits while consuming nonrenewable energy and resources, will produce a few more pennies on the dollar for producers, degrading resource bases for the future, and extend by a few more months, the unsustainable and unreasonable demands of the global first world technocracy. A real revolution would be a sustainable agricultural policy instead of the major world markets shipping beef across oceans to each other. This news sounds very good, but I wonder, do they consider that taking a lot of nitrogen from the atmosphere by the plants may have a negative impact? Anyway, with compare to GMO plants stuffed with chemicals, which are killing the bees, bumblebees and bats. Varroa mite, other disease-carrying parasites, and possibly pesticides are killing the bees, not GMOs. Teech2 (ironic name, I guess) - Interesting thing is that plants had the jump on insecticides before any human intervention - it's part of what gives tea its distinct flavor, and if I'm not mistaken it's what caffeine is for as well... many of the flavors we associate with a number of plants are also anti-insect-chemistry.